Click here for construction information that may affect access to the reclamation ponds. 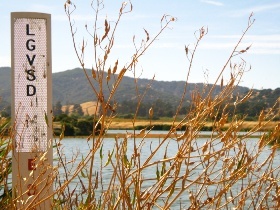 From November through April, the highly treated sewage (tertiary treated recycled water) is released to Miller Creek which leads to San Pablo Bay. From May through October, effluent is then permitted to be reused in one of several ways. From May through October, effluent is disposed of in one of several ways. Some is used to irrigate pasture land; some is stored in ponds to accelerate evaporation and for later discharge to Miller Creek; the balance is taken by the Marin Municipal Water District for further treatment/distribution for landscape irrigation. The land used for these purposes is called the reclamation area. It was built in 1985 on 385 acres of property acquired from the St. Vincent’s School for Boys. The project includes a 20 acre wildlife marsh, 40 acres of storage ponds, a 10 acre saltwater marsh, 20 acres of irrigate landscaping and 200 acres of irrigated pasture. As a part of this project, LGVSD dedicated three and one half miles of public access easements along the shore of the storage ponds and around the freshwater marsh. The salt water and freshwater marshes have attracted a great deal of wildlife including many migratory waterfowl. The Audubon Society has cataloged over 200 species of birds within the area. The walking paths are part of the 500-Mile Shoreline Trail Around the Bay in collaboration with the Bay Trail. For more information about the Bay Trail click here. For special events and limited activity usage, a Short-Term Use Permit must be submitted and approved in advance. Guidelines for all events on Las Gallinas Valley Sanitary District property are available here.